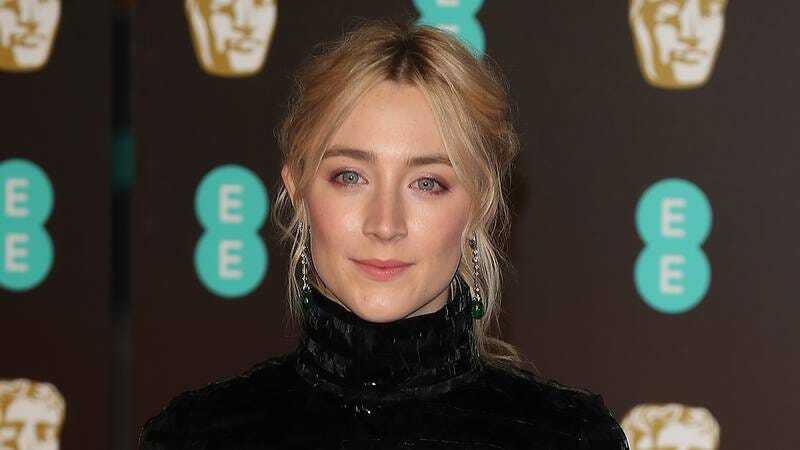 She may be just 23 years old, but Saoirse Ronan has already established herself as one of the finest leading actresses working today. Her Academy Award nomination for Lady Bird marked the third time she’s been up for an Oscar, and by all indications, it won’t be her last. We sat down with the Irish-American actress to ask her about working with Greta Gerwig and Ryan Gosling, and what it’s been like growing up in front of the cameras. 1. You have a beautiful name, though it’s one that many people aren’t quite sure how to pronounce until they hear it out loud. What’s the worst way someone has butchered the pronunciation of your name? When I was young, the scientists that ran experimental tests on me in the subterranean lab where I was grown would always pronounce my name as “Subject 137B.” Each time they’d get close enough to my electrified cage, I’d politely tell them it’s pronounced “sir-shuh,” but they were always too busy trying to grow hundreds of human ears on my back to care about getting my name right. Oh well! I’m used to it at this point. 2. You live in Ireland full-time when you’re not working. What do you love most about living there? The biggest thing for me is getting away from the crazed tabloid culture of the United States. I can’t seem to escape it over here. In Ireland, the only thing our tabloids ever write about is whether the Edge is physically unable to speak because he doesn’t have a tongue or if he can speak but he’s just too afraid of Bono to do it, which makes Ireland the perfect place for me to fly under the radar and relax. 3. What was it like to work with Ryan Gosling for his directorial debut, Lost River? Ryan’s a great actor, but his directorial skills could use some work. For example, there were no bats in the script, but he kept trying to get some to fly into my scenes by yelling, “Bats, can we get a dozen bats in here? Hello? Bats? You guys can fly into the movie now. When I point at Saoirse, that’s your cue to go perch on her shoulders and screech until you die.” It only worked once. The bats gave me rabies. Thankfully, Ryan slept 23 hours a day so I didn’t have to deal with him too often. 4. You starred in Lady Bird, which was a really personal film for writer and director Greta Gerwig. What was it like to star in a project that was so close to the creator’s heart? It was such an honor. To know that Greta grew up in Sacramento and watched all of this stuff actually happen to her best friend, Paula Deen, the person my character is based on, it was so special to me. I feel proud that I could help put Paula Deen’s story out there and that people really responded to it in such a big way. 5. You recently revealed that you had your first kiss on camera. Was that weird for you? Not really. Consider the Kiss Cam. Think about how many different sports venues use the Kiss Cam on any given night: You’ve got baseball, basketball, hockey, football, and probably many more. We’re now looking at a world where a kiss in private is probably pretty rare.